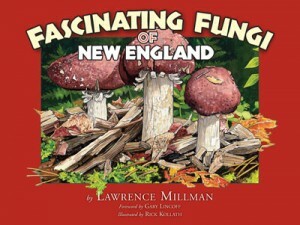 A guest post from mycologist, author, arctic explorer, and ethnographer Lawrence Millman. Mycologists nowadays spend too much time writing grant proposals and not enough time lifting up logs. The latter occupation strikes me as so interesting that I can hardly pass a log without wanting to lift it up. And upon lifting up a log, I’ve occasionally found a cyphelloid species called Henningsomyces candidus. A word about cyphelloid fungi. Their cup or disc-shaped fruiting bodies suggest that they’re discomycetes, but they’re really basidiomycetes or, in the words of mycologist Ian Gibson, “basidiomycete cup fungi.” DNA researchers sometimes refer to them as “reduced agarics,” and reduced they certainly are — most fruiting bodies are no more than a few millimeters in diameter. Yet as if to compensate for their small size, they usually fruit in swarms. 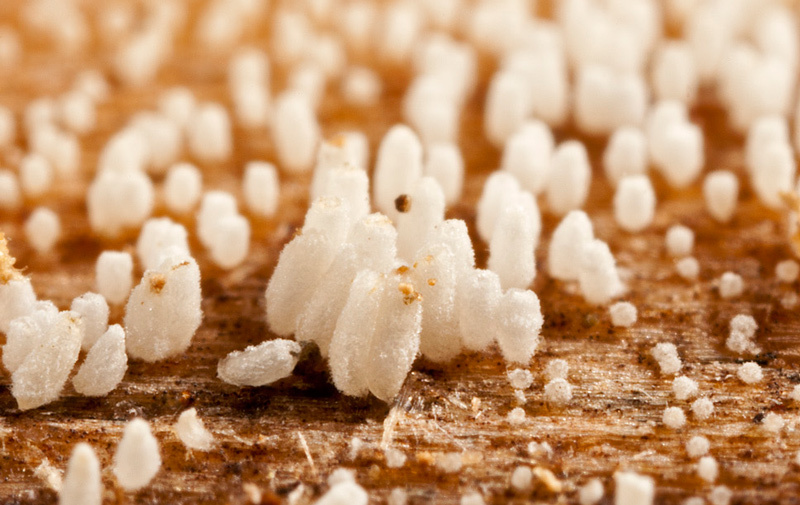 Henningsomyces candidus is so small (1-2 fruiting bodies per mm) that it might be confused with a generic white crust fungus. But get out your hand lens, and you’ll see an array of tubular fruiting bodies with apical pores that resemble sea squirts gone terrestrial. Or perhaps clusters of miniature macaroni. A friend in New Brunswick was even more specific — she compared the fruiting bodies to ziti. With a microscope, you’ll see that each “ziti” (zitum?) has dichophytic hairs around the margin that resemble branches on a tree. You’ll also see fusiform cystidioles, 2 or 4 sterigmate basidia, and subglobose or slightly elliptical spores. If the spores are more than slightly elliptical, you’ve probably peering at a similar species, the scatologically-named Rectipilus fasciculatus, which — MycoKey to the contrary — is not in synonymy with H. candidus. Thanks to Joe Warfel for kind permission to use his photo, of a specimen that he and the author found while lifting logs atop Mount Greylock, in Massachusetts, during the Berkshire Bioblitz.